The original Broadway production of the show, which opened in 1964, had the first musical theatre run in history to surpass 3,000 performances. Fiddler held the record for the longest-running Broadway musical for almost 10 years until Grease surpassed its run. It remains the seventeenth longest-running show in Broadway history. The production was extraordinarily profitable and highly acclaimed. It won nine Tony Awards, including Best Musical, score, book, direction and choreography. It spawned five Broadway revivals and a highly successful 1971 film adaptation and has enjoyed enduring international popularity. It has also been a popular choice for school and community productions. Fiddler on the Roof is based on Tevye (or Tevye the Dairyman) and his Daughters, a series of stories by Sholem Aleichem that he wrote in Yiddish between 1894 and 1914 about Jewish life in a village in the Pale of Settlement of Imperial Russia at the turn of the 20th century. It is also influenced by Life Is with People, by Mark Zborowski and Elizabeth Herzog. Aleichem wrote a dramatic adaptation of the stories that he left unfinished at his death, but which was produced in Yiddish in 1919 by the Yiddish Art Theater and made into a film in the 1930s. In the late 1950s, a musical based on the stories, called Tevye and his Daughters, was produced Off-Broadway by Arnold Perl. Rodgers and Hammerstein and then Mike Todd briefly considered bringing this musical to Broadway but dropped the idea. Investors and some in the media worried that Fiddler on the Roof might be considered "too Jewish" to attract mainstream audiences. Other critics considered that it was too culturally sanitized, "middlebrow" and superficial; Philip Roth, writing in The New Yorker, called it shtetl kitsch. For example, it portrays the local Russian officer as sympathetic, instead of brutal and cruel, as Sholom Aleichem had described him. Aleichem's stories ended with Tevye alone, his wife dead and his daughters scattered; at the end of Fiddler, the family members are alive, and most are emigrating together to America. The show found the right balance for its time, even if not entirely authentic, to become "one of the first popular post-Holocaust depictions of the vanished world of Eastern European Jewry". Harold Prince replaced the original producer Fred Coe and brought in director/choreographer Jerome Robbins. 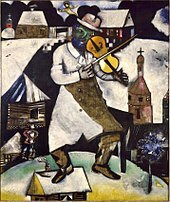 The writers and Robbins considered naming the musical Tevye, before landing on a title suggested by various paintings by Marc Chagall (Green Violinist (1924), Le Mort (1924), The Fiddler (1912)) that also inspired the original set design. Contrary to popular belief, the "title of the musical does not refer to any specific painting". During rehearsals, one of the stars, Jewish actor Zero Mostel, feuded with Robbins, whom he held in contempt because Robbins had testified before the House Un-American Activities Committee and hid his Jewish heritage from the public. Other cast members also had run-ins with Robbins, who reportedly "abused the cast, drove the designers crazy [and] strained the good nature of Hal Prince". Tevye, a poor Jewish milkman with five daughters, explains the customs of the Jews in the Russian shtetl of Anatevka in 1905, where their lives are as precarious as the perch of a fiddler on a roof ("Tradition"). At Tevye's home, everyone is busy preparing for the Sabbath meal. His sharp-tongued wife, Golde, orders their daughters, Tzeitel, Hodel, Chava, Shprintze and Bielke, about their tasks. Yente, the village matchmaker, arrives to tell Golde that Lazar Wolf, the wealthy butcher, a widower older than Tevye, wants to wed Tzeitel, Tevye's eldest daughter. The next two daughters, Hodel and Chava, are excited about Yente's visit, but Tzeitel is unenthusiastic and pretends to be Yente to scare her younger sisters ("Matchmaker, Matchmaker"). A girl from a poor family must take whatever husband Yente brings, but Tzeitel wants to marry her childhood friend, Motel the tailor. Tevye is delivering milk, pulling the cart himself, as his horse is lame. He asks God: Whom would it hurt "If I Were a Rich Man"? The bookseller tells Tevye news from the outside world of pogroms and expulsions. A stranger, Perchik, hears their conversation and scolds them for doing nothing more than talk. The men dismiss Perchik as a radical, but Tevye invites him home for the Sabbath meal and offers him food and a room in exchange for tutoring his two youngest daughters. Golde tells Tevye to meet Lazar after the Sabbath but does not tell him why, knowing that Tevye does not like Lazar. Tzeitel is afraid that Yente will find her a husband before Motel asks Tevye for her hand. But Motel resists: he is afraid of Tevye's temper, and tradition says that a matchmaker arranges marriages. Motel is also very poor and is saving up to buy a sewing machine before he approaches Tevye, to show that he can support a wife. The family gathers for the "Sabbath Prayer." After the Sabbath, Tevye meets Lazar for a drink at the village inn, assuming mistakenly that Lazar wants to buy his cow. Once the misunderstanding is cleared up, Tevye agrees to let Lazar marry Tzeitel – with a rich butcher, his daughter will never want for anything. All join in the celebration of Lazar's good fortune; even the Russian youths at the inn join in the celebration and show off their dancing skills ("To Life"). Outside the inn, Tevye happens upon the Russian Constable, who has jurisdiction over the Jews in the town. The Constable warns him that there is going to be a "little unofficial demonstration" in the coming weeks (a euphemism for a minor pogrom). The Constable has sympathy for the Jewish community but is powerless to prevent the violence. The next morning, after Perchik's lessons with the younger sisters, Tevye's second daughter Hodel mocks Perchik's Marxist interpretation of a Bible story. He, in turn, criticizes her for hanging on to the old traditions of Judaism, noting that the world is changing. To illustrate this, he dances with her, defying the prohibition against opposite sexes dancing together. The two begin to fall in love. Later, a hungover Tevye announces that he has agreed that Tzeitel will marry Lazar Wolf. Golde is overjoyed, but Tzeitel is devastated and begs Tevye not to force her. Motel arrives and tells Tevye that he is the perfect match for Tzeitel and that he and Tzeitel gave each other a pledge to marry. He promises that Tzeitel will not starve as his wife. Tevye is stunned and outraged at this breach of tradition, but impressed at the timid tailor's display of backbone. After some soul-searching ("Tevye's Monologue"), Tevye agrees to let them marry, but he worries about how to break the news to Golde. An overjoyed Motel celebrates with Tzeitel ("Miracle of Miracles"). In bed with Golde, Tevye pretends to be waking from a nightmare. Golde offers to interpret his dream, and Tevye "describes" it ("Tevye's Dream"). Golde's grandmother Tzeitel returns from the grave to bless the marriage of her namesake, but to Motel, not to Lazar Wolf. Lazar's formidable late wife, Fruma-Sarah, rises from her grave to warn, in graphic terms, of severe retribution if Tzeitel marries Lazar. The superstitious Golde is terrified, and she quickly counsels that Tzeitel must marry Motel. While returning from town, Tevye's third daughter, the bookish Chava, is teased and intimidated by some gentile youths. One, Fyedka, protects her, dismissing the others. He offers Chava the loan of a book, and a secret relationship begins. The wedding day of Tzeitel and Motel arrives, and all the Jews join the ceremony ("Sunrise, Sunset") and the celebration ("The Wedding Dance"). Lazar Wolf gives a fine gift, but an argument arises with Tevye over the broken agreement. Perchik ends the tiff by breaking another tradition: he crosses the barrier between the men and women to dance with Tevye's daughter Hodel. The celebration ends abruptly when a group of Russians rides into the village to perform the "demonstration". They disrupt the party, damaging the wedding gifts and wounding Perchik, who attempts to fight back, and wreak more destruction in the village. Tevye instructs his family to clean up the mess. § The 2004 revival featured a song for Yente and some women of the village (Rivka and Mirala) titled "Topsy Turvy", discussing the disappearing role of the matchmaker in society. The number replaced "The Rumor/I Just Heard". Rabbi, the wise village leader. Constable, the head of the local Russian police, a Christian man. Following its tryout at Detroit's Fisher Theatre in July and August 1964, then Washington in August to September, the original Broadway production opened on September 22, 1964, at the Imperial Theatre, transferred in 1967 to the Majestic Theatre and in 1970 to The Broadway Theatre, and ran for a record-setting total of 3,242 performances. The production was directed and choreographed by Robbins – his last original Broadway staging. The set, designed in the style of Marc Chagall's paintings, was by Boris Aronson. A colorful logo for the production, also inspired by Chagall's work, was designed by Tom Morrow. Chagall reportedly did not like the musical. The cast included Zero Mostel as Tevye the milkman, Maria Karnilova as his wife Golde (each of whom won a Tony for their performances), Beatrice Arthur as Yente the matchmaker, Austin Pendleton as Motel, Bert Convy as Perchik the student revolutionary, Gino Conforti as the fiddler, and Julia Migenes as Hodel. Mostel ad-libbed increasingly as the run went on, "which drove the authors up the wall." Joanna Merlin originated the role of Tzeitel, which was later assumed by Bette Midler during the original run. Carol Sawyer was Fruma Sarah, Adrienne Barbeau took a turn as Hodel, and Pia Zadora played the youngest daughter, Bielke. Both Peg Murray and Dolores Wilson made extended appearances as Golde, while other stage actors who have played Tevye include Herschel Bernardi, Theodore Bikel and Harry Goz (in the original Broadway run), and Leonard Nimoy. Mostel's understudy in the original production, Paul Lipson, went on to appear as Tevye in more performances than any other actor (until Chaim Topol), clocking over 2,000 performances in the role in the original run and several revivals. Florence Stanley took over the role of Yente nine months into the run. The production earned $1,574 for every dollar invested in it. It was nominated for ten Tony Awards, winning nine, including Best Musical, score, book, direction and choreography, and acting awards for Mostel and Karnilova. The original London West End production opened on February 16, 1967, at Her Majesty's Theatre and played for 2,030 performances. It starred Topol as Tevye, a role he had previously played in Tel Aviv, and Miriam Karlin as Golde. Alfie Bass, Lex Goudsmit and Barry Martin eventually took over as Tevye. Topol later played Tevye in the 1971 film adaptation, for which he was nominated for an Academy Award, and in several revivals over the next four decades. The show was revived in London for short seasons in 1983 at the Apollo Victoria Theatre and in 1994 at the London Palladium. The fifth Broadway revival began previews on November 20 and opened on December 20, 2015 at the Broadway Theatre, with concept and choreography based on the original by Jerome Robbins. Bartlett Sher directed, and Hofesh Shechter choreographed. The cast starred Danny Burstein as Tevye, with Jessica Hecht as Golde, Alexandra Silber as Tzeitel, Adam Kantor as Motel, Ben Rappaport as Perchik, Samantha Massell as Hodel and Melanie Moore as Chava. Judy Kuhn replaced Hecht as Golde on November 22, 2016, for the last five weeks of the run. Designers include Michael Yeargan (sets), Catherine Zuber (costumes) and Donald Holder (lighting). Initial reviews were mostly positive, finding Burstein and the show touching. The production was nominated for three Tony Awards but won none. It closed on December 31, 2016 after 463 performances. A revival played at the Menier Chocolate Factory from November 23, 2018 until March 9, 2019, directed by Trevor Nunn and starring Andy Nyman as Tevye and Judy Kuhn as Golde. The production transferred to the Playhouse Theatre in the West End on March 21, 2019, with an official opening on March 27. A revival played at Chichester Festival Theatre from 10 July to 2 September 2017, directed by Daniel Evans and starring Omid Djalili as Tevye and Tracy-Ann Oberman as Golde. The original Australian production opened on June 16, 1967, at Her Majesty's Theatre in Sydney. It starred Hayes Gordon as Tevye and Brigid Lenihan as Golde. The production ran for two years. The first professional revival tour was staged by the Australian Opera in 1984 with Gordon again playing Tevye. A young Anthony Warlow played Fyedka. In 2005 and 2007, Topol recreated his role as Tevye in Australian productions, with seasons in Sydney, Brisbane, Melbourne, Perth, Wellington and Auckland. The musical was again revived in Melbourne and Sydney in 2015–2016 with Anthony Warlow as Tevye, Sigrid Thornton as Golde and Lior as Motel. Topol in 'Fiddler on the Roof': The Farewell Tour opened on January 20, 2009, in Wilmington, Delaware. Topol left the tour in November 2009 due to torn muscles. He was replaced by Harvey Fierstein. National Yiddish Theater Folksbiene's mounted a limited run in Yiddish at Museum of Jewish Heritage, in New York City, under the direction of Joel Grey. The cast included Jackie Hoffman as Yente, Steven Skybell as Tevye, Daniel Kahn as Perchik, Stephanie Lynne Mason as Hodel and Raquel Nobile as Shprintze. The first preview was on July 4, 2018, and opening night was July 15, 2018. The production played through the end of 2018. The production is set to be reproduced at Stage 42, an Off-Broadway theater, in early 2019. Skybell and Hoffman will reprise their roles. Previews are scheduled to begin February 11, with opening night on February 21, 2019. The film version was released in 1971, directed and produced by Norman Jewison, and Stein adapted his own book for the screenplay. The casting of Chaim Topol over Zero Mostel for the role of Tevye caused controversy at first. The film received mostly positive reviews from film critics and became the highest-grossing film of 1971. Fiddler received eight Oscar nominations, including Best Picture, Best Director for Jewison, Best Actor in a Leading Role for Topol, and Best Actor in a Supporting Role for Leonard Frey (as Motel; in the original Broadway production, Frey was the rabbi's son). It won three, including best score/adaptation for arranger-conductor John Williams. 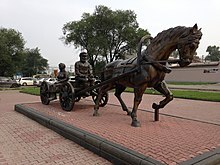 In the film version, the character of Yente is reduced, and Perchik's song to Hodel "Now I Have Everything" is cut and replaced by a scene in Kiev. The "Chagall color palette" of the original Broadway production was exchanged for a grittier, more realistic depiction of the village of Anatevka. Theatre writer John Kenrick writes that the original Broadway cast album released by RCA Victor in 1964, "shimmers – an essential recording in any show lover's collection", praising the cast. The remastered CD includes two recordings not on the original album, the bottle dance from the wedding scene and "Rumor" performed by Beatrice Arthur. Kenrick writes that while the original Broadway cast version is the clear first choice among recordings of this musical, he also likes the Columbia Records studio cast album with Bernardi as Tevye; the film soundtrack, although he feels that the pace drags a bit; and some of the numerous foreign versions, including the Israeli, German and Japanese casts. ^ Paulson, Michael. "Fiddler on the Roof Gets a Debated Update", The New York Times, December 18, 2015, accessed March 6, 2018; and TIME magazine, May 26, 2008 issue, p. 51 (reporting that Fiddler ranked as the seventh most frequently produced musical by U.S. high schools in 2007. ^ Fiddler On The Roof, Guide to Musical Theatre, accessed July 24, 2016. ^ "London's Chocolate Factory to Revive Fiddler on the Roof | Playbill". Playbill. Retrieved 2018-08-17. ^ "Fiddler on the Roof". Chichester Festival Theatre. 2018-08-17. Retrieved 2018-08-17. ^ "Contrasts for opening of Australian Opera season". The Canberra Times. 58, (17, 792). Australian Capital Territory, Australia. 15 June 1984. p. 13. Retrieved 25 January 2018 – via National Library of Australia. 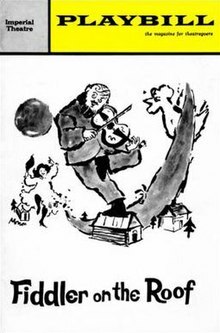 ^ "'Fiddler' received with enthusiasm". The Canberra Times. 58, (17, 799). Australian Capital Territory, Australia. 22 June 1984. p. 13. Retrieved 25 January 2018 – via National Library of Australia. ^ "Chaim Topol". AusStage. 2017. Retrieved 26 November 2017. ^ Passy, Charles. "N.Y. Theater Company Will Present an All-Yiddish ‘'Fiddler", The Wall Street Journal, December 21, 2017. Accessed July 6, 2018. Isenberg, Barbara (2014). Tradition! : The Highly Improbable, Ultimately Triumphant Broadway-to-Hollywood Story of Fiddler on the Roof, the World’s Most Beloved Musical. New York: St. Martin's Press. ISBN 978-0-312-59142-7. Wikimedia Commons has media related to Fiddler on the Roof.